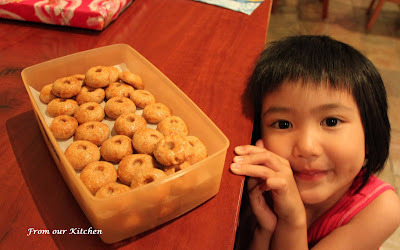 I decided that it is time for me to teach my two girls the ritual of baking cookies for Chinese New Year cookies. We started out with something quite simple (well, simple to make except for the preparation of the peanuts). I bought the peanuts with skin on and roasted them in the oven for 25-30 minutes at 140C. Then, I had the messy and onerous task of removing the skin. Once that's done, I used the food processor to grind the peanuts. Ashleigh and Caitlin had fun rolling the dough into little balls and making the imprint on the top. Caitlin had the all important task of painting the egg wash on the top of the cookies. The first patch that we made were slightly burnt as the oven temperature was set too high. These photos are from the second batch. Packed and ready as gifts. Mix the dry ingredients like sugar, salt, nuts and flour in a big mixing bowl with fingertips until they are mixed well and crumbly. Add oil bit by bit and knead the mixture. Once you can roll up the mixture into a small ball without the surface crumbling, then stop adding more oil. Knead the mixture for a while to ensure that the sugar melts. You can tell by looking at the dough. It shouldn’t have speckles of shiny sugar grains but a smooth texture. Roll the dough into small balls and place them on a parchment paper and baking tray. Use a circular tube (like a straw or base of a Chinese paint brush) and press gently on the top of the balls to make round indents. Glaze with egg before baking. To glaze, just beat one egg yolk and brush on the cookie. Temperature: 120-140C. (my oven is quite hot so I set mine to 90-110C). I am sending this to Shaz of Test with Skewer as my 2nd entry for Malaysian Monday. Thanks you for the great entry. One of my favourite cookies. I made them the "cheating" way once, used peanut butter! 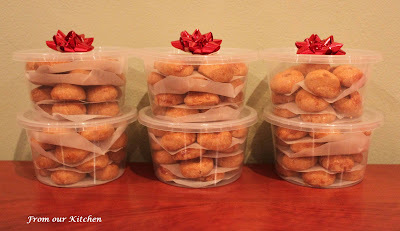 These must undoubtedly taste very good thanks to all that effort. Shaz, how do you make these cookies with peanut butter? I've never tried that before. this looks SO YUMMY!!! Cait looks like she's about to wallop them all in one go!